Butomus umbellatus commonly known as flowering rush, is a moderately tall, rush like perennial found on shores of lakes, ponds and riverbanks. It can tolerate water as deep or deeper than 2 metres, extending to the deepest range of emergent marsh species. Flowering rush can displace native riparian vegetation, and can be an obstacle to boat traffic. Once established, populations' increase and can persist indefinitely. Control of this species is very difficult, especially with herbicides because they easily wash away from the narrow leaves of this plant. Extensive physical methods of control must be employed to manage this invasive exotic. It can be spread over long distances by garden planting, and once established in a watershed it spreads locally by rhizomes and root pieces that break off. Muskrats use parts of the plant and contribute to its local spread. Boaters can also transport flowering rush on their equipment. 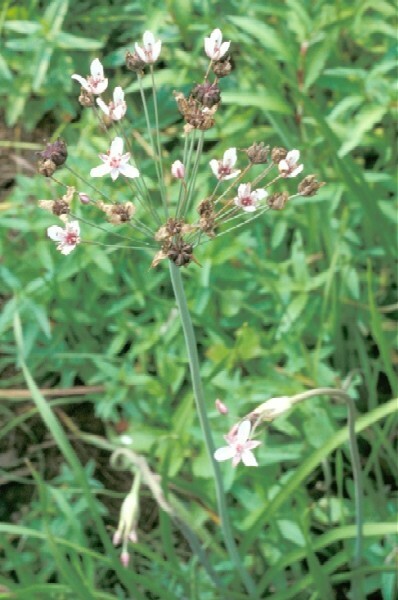 Flowering rush is described as a moderately tall, rush-like perennial. Its leaves are basal originating from a stout rhizome that is stiff and erect when immersed or lax and floating when in deep water. The inflorescence is a many-flowered umbel borne on a scape 1 to 1.5m tall. The flowers are perfect, regular, 2-3cm across, and pink. There are 3 sepals, which are petaloid. There are 3 petals, 9 stamens, with elongate anthers. 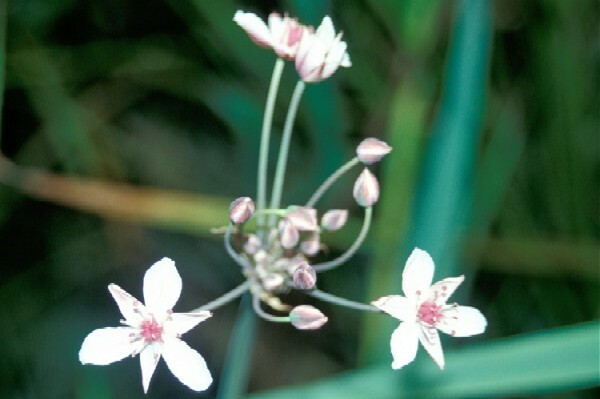 Flowering rush has 6 pistils that are simple, whorled, and united at the base. The fruit is an indehiscent, many-seeded capsule (USGS-NPWRC, 1999). Flowering rush is in flower from July to September, and the seeds ripen from August to September (in North America). The scented flowers are hermaphrodite and are pollinated by bees, flies and Lepidoptera (Plants for a Future, UNDATED). Flowering rush tuber can be cooked. It should be peeled and the rootlets removed. The root can also be dried and ground into a powder; it can then be used as a thickener in soups etc, or be added to cereal flours when making bread. It contains more than 50% starch (Plants for a Future, UNDATED). Flowering rush grows in marshes and can tolerate water as deep or deeper than that in which cattail is normally found (up to 2 metres), extending to the deepest range of emergent marsh species (Fewless, UNDATED). IPANE (2001) reports that, \"B. umbellatus is mostly found on shores of lakes, ponds and riverbanks, and it is intolerant of salt or brackish water. Proulx (2000), states that, \"B. umbellatus is probably spread over long distances by people who plant it in gardens. Once in a watershed it spreads locally by rhizomes and root pieces that break off and form new plants. Muskrats may use parts of the plant to build houses and probably contribute to its local spread. Boaters can transport B. umbellatus on their equipment. Water and ice movements can easily carry B. umbellatus to new areas of a water body.\" Proulx (2000) adds that, \"Once in a watershed it spreads locally by rhizomes and root pieces that break off and form new plants.\" Delisle et al. (2003) states that, \"B. umbellatus required less than 17 years (1905-22) to establish scattered colonies between Montréal and Québec City. Seeds may disperse over longer distances than vegetative fragments; this characteristics may further increase the rate at which this species spreads.\" The authors add that, \"The warmer temperatures of newly exposed soils promote sprouting of B. umbellatus, which leads to multiplication of shoots and establishment of new individuals from rhizome fragments.\"
Flowering rush grows well in light (sandy), medium (loamy) and heavy (clay) soils. The plant prefers acid, neutral and basic (alkaline) soils. It cannot grow in the shade. It requires wet soil and can grow in water (Plants for a Future, UNDATED). Recommended citation: Global Invasive Species Database (2019) Species profile: Butomus umbellatus. Downloaded from http://www.iucngisd.org/gisd/species.php?sc=610 on 21-04-2019. IPANE (2001) reports that, \"B. umbellatus can displace native riparian vegetation, and can be an obstacle to boat traffic. Its very wide range of hardiness (zones 3-10) makes it capable of being widely invasive in the United States.\" Fewless (UNDATED) states that, \"Once established in a marsh, B. umbellatus populations increase and persist indefinitely.\"
Mechanical: Proulx (2000), states that, \"Cutting flowering rush below the water surface is an effective method of control. Cutting will not kill the plant but it will decrease the abundance. Multiple cuts may be required throughout the summer as flowering rush grows back from the root. All cut plant parts must be removed from the water. Hand digging can be used to remove isolated plants that are located downstream of larger infestations. Extreme care must be taken to remove all root fragments. Any disturbance to the root system will cause small reproductive structures on the roots to break off and spread to other areas of the waterbody. Therefore, methods such as raking or pulling which disturb the root system, but do not remove it, are not recommended control strategies. 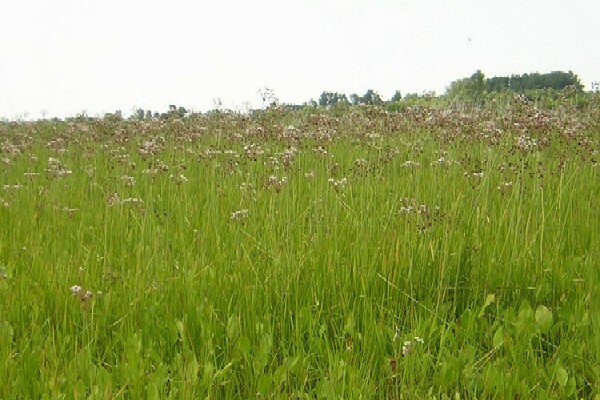 Chemical: It is very difficult to kill flowering rush with herbicides. Herbicides easily wash away from the narrow leaves of this plant. Herbicides are more effective on dry banks or in very shallow water. 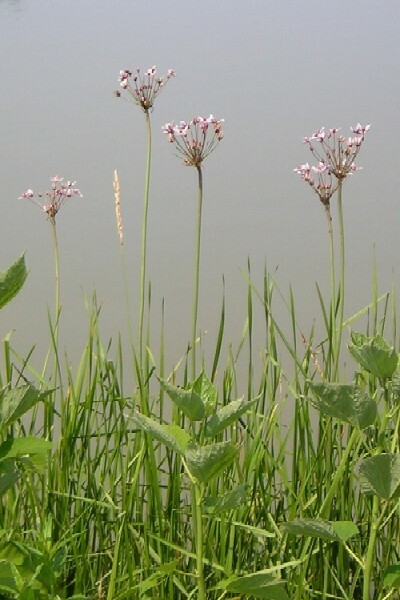 There is no herbicide that is selective for flowering rush and care must be taken to avoid damage to valuable wetland plants such as cattails.\"
Informations on Butomus umbellatus has been recorded for the following locations. Click on the name for additional informations. Delisle, F., C. Lavoie, M. Jean, & D. Lachance. 2003. Reconstructing the spread of invasive plants: taking into account biases associated with herbarium specimens. Journal of Biogeography 30:1033-1042. Fewless, G. UNDATED. Butomus umbellatus: flowering rush. Invasive Plants of Wisconsin: Cofrin Center for Biodiversity, University of Wisconsin, Green Bay. Lavoie, C., M. Jean, F. Delisle, & G. Le tourneau. 2003. Exotic plant species of the St. Lawrence River wetlands: a spatial and historical analysis. Journal of Biogeography 30:537-549. Plants For A Future, 2004. Butomus umbellatus. Proulx, N. 2000. Exotic Flowering Rush. Minnesota Sea Grant: Regents of the University of Minnesota. USGS-NPWRC (Northern Prairie Wildlife Research Center). 1999. Butomus umbellatus L. Aquatic and Wetland Vascular Plants of the Northern Great Plains [Online Database]: 50. Butomaceae, The Flowering Rush Family. Eckert, C.G., Massonnet, B. & Thomas, J.J., 2000. Variation in sexual and clonal reproduction among introduced populations of flowering rush, Butomus umbellatus (Butomaceae). Canadian Journal of Botany, 78, 437�446. Hroudova� , Z., Krahulcova� , A., Za�kravsky� , P. & Jaroli�mova�, V., 1996. The biology of Butomus umbellatus in shallow waters with fluctuating water level. Hydrobiologia, 340, 27�30. IPANE (Invasive Plant Atlas of New England). 2001. Berberis thunbergii. Department of Ecology and Evolutionary Biology, University of Connecticut [Online Database]. USDA-GRIN (Germplasm Resources Information Network). 2003. Butomus umbellatus. National Genetic Resources Program [Online Database] National Germplasm Resources Laboratory, Beltsville, Maryland. USDA-NRCS (Natural Resource Conservation Service). 2002. Butomus umbellatus. The PLANTS Database Version 3.5 [Online Database] National Plant Data Center, Baton Rouge, LA.